Liquid water isn't just a thing of the past for Mars -- NASA just revealed that it's also present on the planet's surface today, the New York Times reports. Scientists have detected evidence of hydrated salts on the surface of Mars, which are produced by liquid water. That leads to the conclusion that liquid water is far more prevalent on Mars than we ever thought. Alfred S. McEwan, a University of Arizona professor of planetary geology, made the discovery along with other scientists after going over images from NASA's Mars Reconnaissance Orbiter. Back in 2011, they found dark streaks (dubbed "recurrent slope linae," or R.S.L.s) alongside canyons, slopes and craters on Mars, which lengthened and disappeared seasonally. Scientists figured water might have been involved with R.S.L. 's initially, but it wasn't confirmed until they pointed a spectrometer on the Martian surface and discovered the hydrated salts. So how does water stay liquid on Mars, where the average temperature is around -70 fahrenheit? Just like on Earth, the salts lower the freezing temperature of water on Mars, which allows it to stay liquid. And it also helps that Mars can get to around 70 fahrenheit around its equator in the summer. As exciting as today's findings are, the scientists still don't know where the liquid water might be coming from on Mars. Our current readings of the planet's atmosphere point to very low humidity near the surface, but we're also basing that on poor readings from the surface, Dr. McEwan said. There's also a chance that it might be coming from underground aquifers on the planet, which seep out when things warm up. And what does this mean for life on Mars? NASA astrobiologist Christopher P. McKay notes that R.S.L. 's might not be the best place to look, since they would be too salty for most habitable life. Other scientists note that some streaks might be saltier than others, which leaves open the possibility of microbial life on the less briny streaks. Sadly, it'll be a while before we get a close look at the streaks -- that would require a sterilized spacecraft, and we currently don't have plans to send one of those to Mars anytime soon. 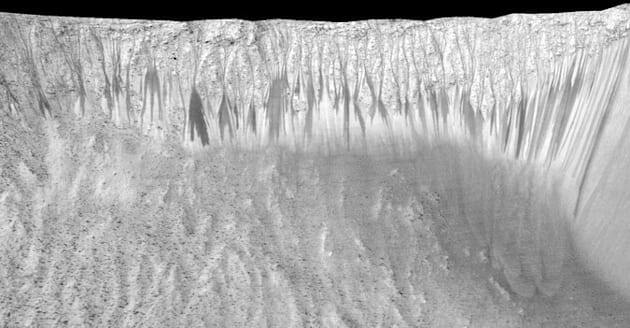 We've known for a while now that Mars currently holds large reserves of frozen water at its poles, and that it had large oceans billions of years ago. But this most recent discovery changes our notion of Mars entirely from a dry desert, to a planet that's still alive. And you can bet it'll have a huge impact on how we plan Martian missions going forward.